In case you’re not familiar with Corbett’s prior works, he’s the creator behind ThinkTraffic.net, ExpertEnough.com and CorbettBarr.com (his personal blog). If you visit any of these sites, you will find me as a regular commenter on any of the mentioned sites since I just LOVE what he does online. He’s also part of the Digital Nomad Academy community where I talked about on a prior article here Digital Nomads And Minimalism. 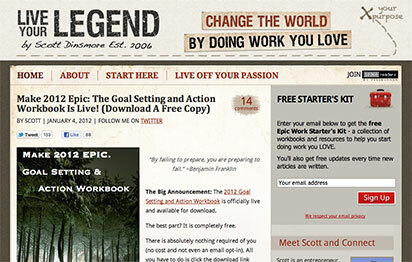 Corbett has also helped his clients launch and grow blogs that attract from 10,000 to 100,000+ visitors including sites like Live Your Legend, Man Vs. Debt, Primer Magazine and The Possibility of Today. Remember what I told you about hooking up with the right people on Turn The Page? Well I asked for permission to Corbett a few days ago since I used his image and name on the blog and this is what I received. Permission granted for mentioning, thanks! Right now Corbett has been telling his affiliates that they can offer webinars, recordings, interviews and such in order to make more sales, unfortunately I’m nowhere big so that’s out of the question for me but I’m pretty happy by telling the few followers and readers that I have about it. The training contains 13 weekly lessons (lucky number?) 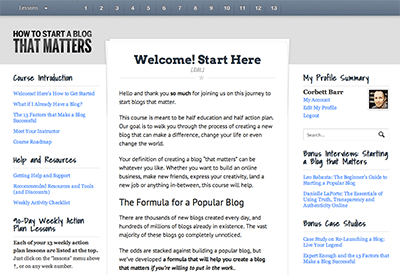 to guide you through starting a blog that matters over 90 days. You need to choose a great topic, set up your blog and end up building your audience and spreading your brand all over. Each of the lessons comes with a specific action plan including a combination of text, checklists and over 8 hours of video. This isn’t just about learning, it’s about doing. Week 1: Choose the right topic for you. Week 2: Develop the perfect blog name and brand. Week 3: Design your blog to look great. Week 4: Create your social media strategy. Week 5: Develop your launch plan. Week 6: Learn how to create outstanding content. Week 7: Create your launch content. Week 8: Launch your blog. Week 9: Start making friends in the blogosphere. Week 10: Build your thriving audience. Week 11: Expand your reach using webinars, YouTube, podcasts and more. Week 12: Make your first dollar blogging. Week 13: Develop your strategy for taking your blog to the next level. One e-mail consultation about any topic you might need help with. If I don’t have the answer to your question I have direct access to a six figure Internet Marketer mentor to whom I can ask anything about the IM niche. 2 reports specific to your chosen niche that will help you get a foundation base and get you started as soon as possible. I’m currently creating my first Internet Marketing products and I always reward the people that work with me and follow me. If you happen to like the things that I write around here, I will consider you for special discounts on most of the products I create in the near future, as well for any coaching courses that I open on 2012. You should know that I keep every promise I make. Send me a copy of your receipt to bonus [at] marketingwithsergio [dot] com including your name and best e-mail address so I can add you to the special partner’s list. You’ll receive a personal confirmation message from myself for further details. Special Note: If you are NOT interested in any of the bonuses mentioned here, you can still buy through my affiliate link and just let me know about it. I reciprocate buying through my friends and also believe in good karma! 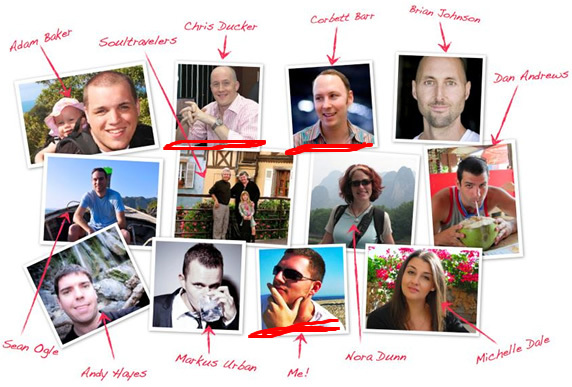 There’s a special bonus “kick off” live webinar where you can ask anything you want. This is just for the first 100 people to sign up for the course and it is scheduled in two weeks from now. Special introductory ‘”launch” price. The course is going to be offered at $97 however, if you order within the next 72 hours, your special price is just $77. This will expire at the end of this week (Friday 1/20 at Midnight PST). Course already went up to $97. See you soon and hope you take your blog to the next level! You are on a roll right now. You don’t post for a few days and then knock out two well-researched review posts almost on top of each other. Your blog is fascinating because it offers a snapshot of what you are doing right now and it is clear that you are really taking action to move your online business forward. Thank you man. I really try to put my actions where my mouth is. If I want to become the best I can, then I have to learn from the best of the best and Corbett is one of those. I will definitely write deeper about this coaching as soon as I’m more familiar with the site and the training. Hi Sergio, this looks great. I need to know more about this coaching, in special from your experience. Thanks. I have seen a few of the bonus videos already and I can tell you that Corbetts’ course is simply FANTASTIC. 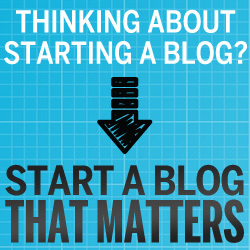 I do recommend it to anyone who is serious about building a blog that really goes beyond amazing. Looks interesting. Great job on the review and it’s great that you are offering bonuses! Hey Sergio, great in depth review post. It does take a lot to write a great review and you seem to have made a great one here. 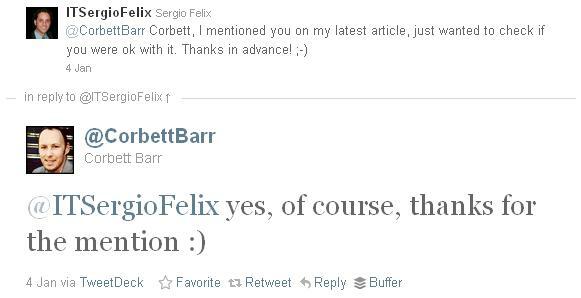 I look forward to seeing what Corbett has to teach Sergio over the next few weeks. Yeah I have been following Corbett for a while at his personal blog and I really like how he connects with his audience. They are both interviewed by Corbett and right now I have understood many points I wasn’t even thinking about in the past, I’m definitely getting ready to go big. I am thinking of making an insider’s review as soon as I get a little bit deeper in the course. Loved the review also Sergio and I’m sure Corbett is thrilled with this as well. I read about this over at Benny’s place so looks like you both have really enjoyed this course. I have no doubt there is a lot I can still learn about taking my blog and business to yet another level. For now though I have to hold back on more education since I have plenty right now I’m still trying to get through. But I sure can’t wait until you share more posts with us about what you’ve been learning. I’m so excited for you and I can’t wait to read what you’ll be sharing with us. Thanks for the info Sergio and have a fabulous week my friend. You’re absolutely right. I have a lot more training courses to go through and couldn’t get myself into more ventures myself even if I wanted, so kudos to you for keeping yourself accountable and focus. I don’t know if I’ll document what I learn on the course, I’m thinking of actually just applying it here, so hopefully we’ll see a dramatic change very soon. Sounds like some great material from Corbett and I’m sure that your bonuses are killah! Awesome stuff. I’m a bit knee deep in some new material I’m implementing into my own biz right now but am definitely going to keep this on my easy referral list. I’ve got quite a good one I’ve been putting together! Great job on the review too, by the way!! I always say that if you’re already working with something good, just keep going strong at it and don’t get into anything else! I know you’re very busy right now and wouldn’t like to distract you from your goals with this offer, so kudos to you for staying laser focused and hope to hear some positive feedback from your efforts soon, deal?